I started doing Botox two years ago, at age 25, when I started my business (you know… injecting Botox). Personal experience has taught me a lot about the products I use for Aesthetic Procedures, and that’s why I make it a point to use all of them. Do I need them? No… Probably not (except the duck lips… those I need…). Are they hurting me? Definitely not, they’ve been around for YEARS (especially Botox). Remember this face? How could you forget it? I look angry! (it’s from my post on facials). I clearly have needed Botox for some time. I get migraines when I’m in need of Botox. I look angry when I’m in need of Botox. I get Botox in my forehead and glabellar crease. When I started, I got Botox every two months. Here’s my medical records for y’all as an example. **Remember, results will vary. Everyone has a different face! If you keep up on your Botox, as soon as you have movement back, you will get more and more out of your Botox injections. Most people go down in the amount of Botox they require as well. My doses are minimal. Plus I like that zero movement look. Especially now that I don’t have my Barbie hair… I need to keep my Barbie face (in case you’re a new reader, I recently switched teams… I’m a brunette now). The reason for this is called muscle atrophy. This process is a natural occurrence in other parts of your body as well. Think about going to the gym a bunch. You get huge muscles. And then you stop. Your muscles die from not being used. The body naturally metabolizes the muscle tissue. Same thing basically happens if you’re not using the muscles in your face. It’s not dangerous. It’s a pretty natural process. I didn’t take a very good before picture of my forehead, but my glabella (area between brows) is pretty good. As you can see, it takes 2 days to really see a difference from Botox. Some people it kicks in later. 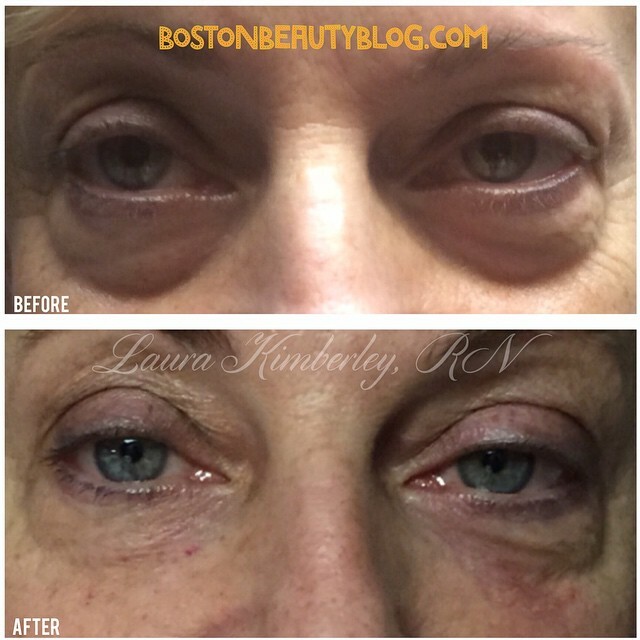 I tell people it takes 2 weeks to see the full difference from a Botox treatment. If in two weeks you have not experienced the results you’ve been looking for (i.e. you still have too much movement) then the dose you were injected with was not enough. I charge by the unit, so if you pay by the unit, you will pay for additional units. If you pay by an area, you may wind up paying for an additional treatment as well. Be careful what you payyyyy forrrrr. You want to pay by the unit. Trust me. And now that my Botox has kicked in, as you can see, I really can’t make that angry face. Makes me look friendly and approachable…. It’s a lot softer look than from before huh? But… I still look like me. All Smiles Baby!